14,000 tulips have bloomed at Big Lake in New Orleans City Park. Oh, to be a fish in City Park! What happens to the Tennis Balls? Funny you should ask! Record Broken! A BIG Bass! Undine! Chances are you recognize this sculpture but didn’t know her name! At the entrance to the Conservatory of the Two Sisters in the New Orleans Botanical Garden is the garden’s collection of aquatics. This pond holds a variety of tropical and hardy water lilies and other aquatics from late March to Fall. The pool is unfiltered. Submerged plants help to keep the water clean while fish eat any mosquito larvae. Each of the plants in the pond is planted in plastic pots raised off the pond’s floor to six to eight inches below the water surface. 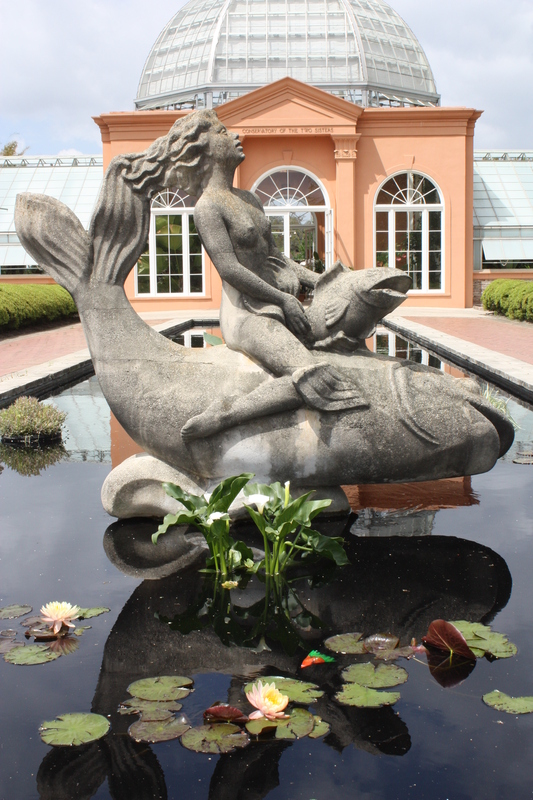 In the keyhole of the pond is Undine, (1935) a sculpture by Rose Marie Huth. The pond is flanked by four formal rose beds holding several varieties of modern roses. Today’s a great day to visit the New Orleans Botanical Garden! Well, any day is a great day! Enter through the Oscar J. Tolmas Building at 5 Victory Avenue. *Free admission for Louisiana residents on Wednesday. Please show your ID to the cashier. Something big is coming soon! They are coming back! We’re talking about the tulips at Big Lake, of course! 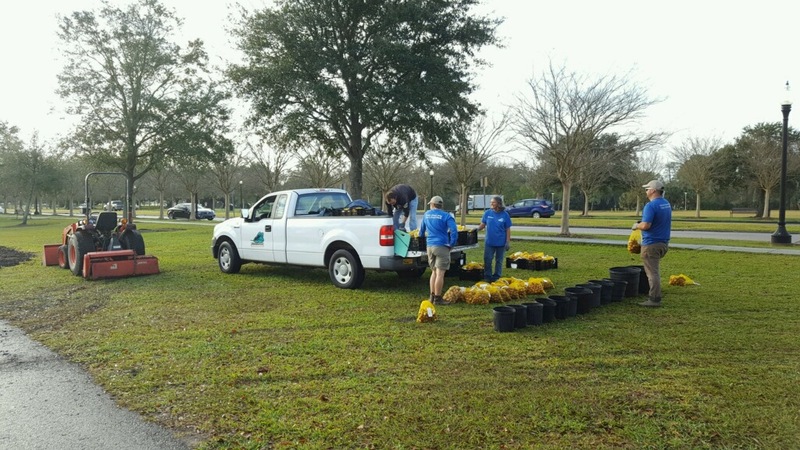 New Orleans City Park staff spent January 12th planting 1000s of tulips bulbs around Big Lake. Their hard work is appreciated by all as it will take about a month and a half for the bulbs to bloom and then we’ll have a massive colorful flower bed. What a way to welcome spring to New Orleans! Over 40 types of tulips have been planted. Some of the names of the tulips are pretty interesting: Exotic Emperor, Happy Family, Pinocchio, Blushing Lady, Temple of Beauty, Early Glory, and more! The tulips will only be in bloom for about 2 weeks. Visit them to brighten your day but be sure to not walk in the flower beds or pick any of the flowers. New Orleans City Park is proud to be able to bring the simple joy of fresh colorful flowers to the patrons of the Park. We look forward to seeing all of your tulip themed photos posted to social media. New Orleans City Park is proud to announce the groundbreaking of the highly anticipated Marconi Bike Path on the west side of the Park. When completed, the new bike path will complete the fourth side of the Park’s bike path project: Robert E Lee, Wisner, Harrison, and now, Marconi. The Marconi Path is a 10 feet wide concrete pathway stretching over one mile, connecting the existing asphalt along Robert E. Lee to the existing bike route along Harrison Avenue. The path is located on the east side of Marconi, passing along the lagoon edge between oak and cypress trees. There will also be a marked bike crossing point added at Filmore. The project is a Transportation Enhancement Project, funded in part by the Louisiana Department of Transportation and Development, Friends of City Park, and the Federal Highway Administration. The path was designed by Burk Kleinpeter, Inc and the contract, competitively bid, was awarded to Command Construction Industries. The cost of the project is $698,888.00. The project’s anticipated completion date is summer 2017. Biking in New Orleans City Park is easy, even if you don’t have your own bike. Bike (and boat) rentals are available at the Boat House on Big Lake: weekdays10 am to 4 pm and weekends 9 am to 4 pm. For more information about renting bikes or bike paths in the Park, visit: NewOrleansCityPark.com/in-the-park/boating-biking or call Wheel Fun Rentals at 300-1289. City Park: is distinguished by its large menu of sports and recreational activities, attractions for children, and its natural beauty. City Park has a special place in the hearts of generations of New Orleanians and is a must visit for visitors to the city. As a popular place to picnic, play a favorite sport, wander through its gardens or take a boat ride- the park receives millions of visitors each year. It is located in the heart of the city and is the largest recreation area for the entire metropolitan area. Attractions include: City Putt, New Orleans Botanical Garden, Storyland fairytale playground, the Carousel Gardens Amusement Park, and numerous athletic venues. The 1,300 acres of parkland provide enjoyment for young children playing on our playgrounds and walkers, joggers, and bicyclists winding through the park's streets and trails. Things to see, eat, and do all around New Orleans!